The Large Displays can handle a wide variety of signal inputs direct from transducer or process transmitters and offer multiple control output options and serial or Ethernet connectivity for logging the data. These meters and controllers can be used in applications where visual monitoring of process signals from a distance are an important consideration. The "Universal Temperature+Process Large Display" (iLD-UTP) is designed for Thermocouples, RTD's, and Process (DC) Voltage or Current. It handles TEN (10) thermocouple types: K, J, T, E, R, S, B, C, N, & J DIN. It works with a wide selection of RTD's, both Pt. 0.00385 and 0.00392 curves for 100 Ohm, 500 Ohm, and 1000 Ohm and it measures with 2, 3, or 4 wire connections for the highest accuracy. This model also measures process voltage: 0-100 mV, 0-1 V, 0-10 V ranges and process current, 0-20 mA (4-20 mA) with built-in excitation of 24 Vdc standard. The "Universal Strain+Process Large Display" (iLD-SP) handles a wide variety of DC voltage and current outputs from all common load cells, pressure transducers, and most any strain gage type of transducer. The meter measures input ranges of 0-100 mV, -100 to 1 V, 0-10 V, 0-20 mA (4-20 mA) with built-in excitation of 5 Vdc and 10 Vdc standard. This model also features Ten (10) Point Linearization enabling accurate measurements from a wide assortment of unique and nonlinear transducers. The Large Displays are easy to configure and scale to virtually any engineering units with the push buttons on the front panel, or with a personal computer using the free configuration software and the optional Ethernet connectivity or Serial Communications. The Ethernet option allows the device to be connected on a standard Ethernet network and communicates using standard TCP/IP protocol. The Ethernet option (-C4EI) also includes RS-485 (and RS-422) Serial Communications. The serial communications option (-C24) includes both RS-232 and RS-485 (and RS-422) on one instrument. It communicates with a straightforward ASCII communications protocol, as well as MODBUS protocol. The Universal Large Displays features a choice of two optional outputs: Form C SPDT (single pole double throw) mechanical relays (-3), Solid State Relays (-2) DC pulse (-4), and/or programmable analog output (-5) selectable as either a controlling function or as retransmission of the process value. The Universal Large Displays can control simple manual operation to ON-OFF and full Autotune PID control. (Selectable preset tune, adaptive tune, PID, PI, PD control modes.) The dual control outputs can be configured for a variety of independent control and alarm applications. The ramp-to-setpoint feature allows the user to define the rate of rise to setpoint, minimizing thermal shock to the load during start-up. Maximum ramp time: 99.59 (HH.MM), Soak: 00.00 to 99.59 (HH.MM), Damping: 1 to 8 in unit steps. Input types: 0 to 20 mA, 0 to 100 mV, 0 to 1 V and 0 to 10 Vdc. The Large Display can be programmed to change colors between RED, AMBER, and GREEN at any set point or alarm point. The Large Display has a wide range of signal inputs as well as control, alarm, and communication outputs including: RS-232, RS-485, MODBUS, and Ethernet. The device with an embedded Web Server can connect directly to Ethernet/Internet. You can "see" your meter and control your process through a web browser over the Internet from halfway around the world. 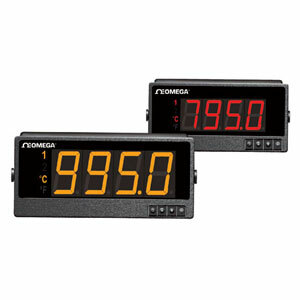 With the Large Display, you can also see your meter from a hundred feet. The Large Display can be mounted flush in a panel or surface mounted with the included brackets. The entire BIG Display enclosure provides NEMA 1 protection. Configuration of the iLD-UTP or iLD-SP can be performed using either -C24 or -C4EI options and the configuration software that is available on our website.